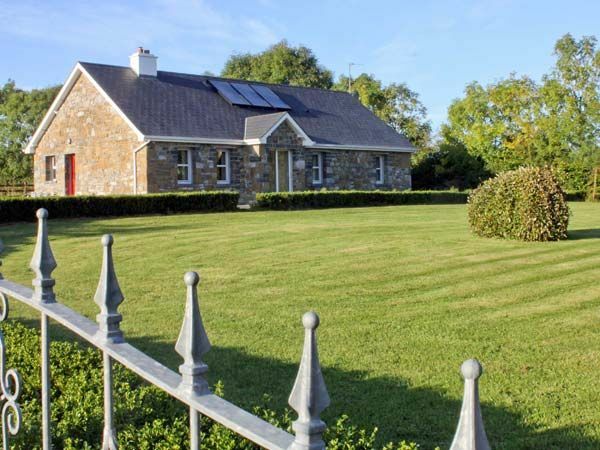 This charming, ground floor, detached stone cottage, situated on the banks of Grange Lough, three miles from Strokestown, can sleep eight people in four bedrooms. Grange Lough is a wonderful, cosy detached cottage, perched perfectly on the banks of Grange Lough, a short drive from the County Roscommon town of Strokestown. Set solely on the ground floor, the cottage has four bedrooms, each with their very own en-suite shower rooms, including three double bedrooms and a twin room. There is also a extra WC for added convenience, a kitchen with a dining area, and a sitting room with a warming open fire. Outside, there is a lawned garden to the front and rear, while the front patio with furniture is ideal for alfresco dining. There is also plenty of off road parking. Set in such a fabulous area, with traditional music showcased regularly at the local pub, Grange Lodge is a wonderful Irish retreat for all the family. Amenities: Oil central heating with open fire. Oil range. Electric oven, gas hob, microwave, fridge, freezer, washing machine, dishwasher, TV with Saorview, DVD, selection of books, games and DVDs. Oil and electricity charged via meter reading (first 30 inc. in rent). Starter pack for fire inc. in rent. Bed linen and towels inc. in rent. Ample off road parking. Enclosed front and rear lawned gardens, plus front patio with furniture. Sorry, no pets and no smoking. Shop 3 miles, pub 1 min walk. Note: The owner has a private jetty a few miles away, boats can be hired directly from the owner at 200 per week. Note: Property is on the banks of a lough, children to be supervised. Town: Situated in the eastern part of County Roscommon is the charming heritage town of Strokestown with its lovely selection of shops and pubs, the Strokestown Golf Club and the annual Agricultural Show. It is home to Strokestown Park House, an 18th century mansion with an exquisite six acre walled garden, which has been restored to its original majesty and the longest herbaceous border in Ireland. It also plays host to the Irish National Great Famine Museum; a superb base for an Irish break, with plenty to explore and discover. All ground floor. Four bedrooms with en-suite shower, basin and WC: 3 x double (two with TV), 1 x twin. Basin and WC. Kitchen with dining area (seats 6). Utility. Sitting room (seats 7) with open fire. Oil central heating with open fire. Oil range. Electric oven, gas hob, microwave, fridge, freezer, washing machine, dishwasher, TV with Saorview, DVD, selection of books, games and DVDs. Oil and electricity charged via meter reading (first €30 inc. in rent). Starter pack for fire inc. in rent. Bed linen and towels inc. in rent. Ample off road parking. Enclosed front and rear lawned gardens, plus front patio with furniture. Sorry, no pets and no smoking. Shop 3 miles, pub 1 min walk. Note: The owner has a private jetty a few miles away, boats can be hired directly from the owner at €200 per week. Note: Property is on the banks of a lough, children to be supervised.